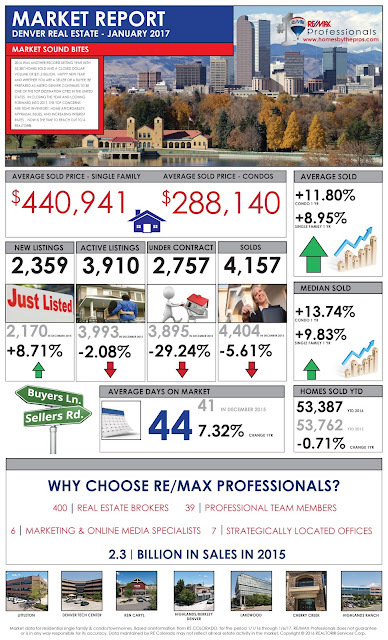 Michael Kozlowski #1 Agent at RE/MAX Professionals 3 Years in a Row! - Closed dollar volume of $1.6 Billion. 2016 was another record setting year with 53,387 homes sold and a closed dollar volume of $21.2 Billion! Happy New Year and whether you are a Seller or a Buyer, be prepared as Metro Denver continues to be one of the top destination cities in the United States. In closing the year and looking forward into 2017, the top concerns are tight inventory, home affordability, appraisal issues, and increasing interest rates . Happy New Year - 2017 is here and as a Seller, what can you expect from the Denver home market? Overall the Denver home market will continue to move forward; but at a slower pace than 2016. Buyer demand will continue to be strong as Denver continues to be a destination city. Price appreciation is not expected to be as great as in 2016. New household formations will continue to increase and multi generations will look to buy. Denver will see more Buyers from all over the world. Denver will continue to be in the top 10 home markets in 2017. Consumers will continue to focus on home ownership. New home builders will focus on increasing the availability of their new home models and try to reduce the time needed to build a new home. Buyers today continue to be savvy and more educated when it comes to home markets. Sellers need to know where they want to live. Home closing time frames are now increasing by at least a week. As a Seller, do not forget the home selling basics, make your plan and stick to it. Happy New Year - 2017 is here and as a Buyer, what can you expect from the Denver home market? 2017 will bring increased home mortgage interest rates, continuous changes to the closing process, home price appreciation, strong Buyer demand as Denver continues to be a destination city, an increase in household formations, more and more Buyer competition will come from all over the world, and market conditions that may challenge all. The definition of what makes a home is dramatically evolving from tiny home to multi generational. Create your home buying plan and stick to it.